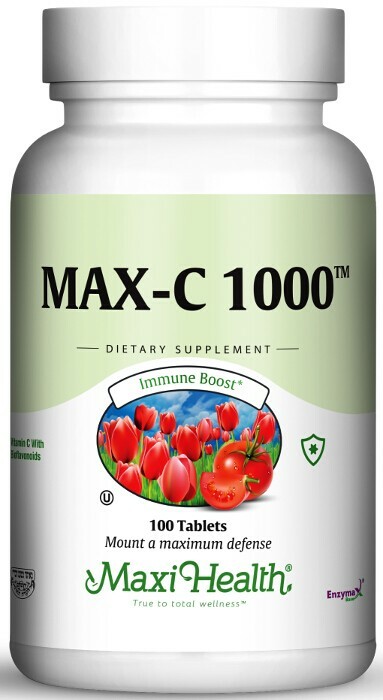 Max C 1000™ is our vitamin C - bioflavonoid complex which works to support blood vessel, capillary, and vein strength. It also helps support a healthy immune system, connective tissue integrity, healthy function of the gums. Together these nutrients act as antioxidants to fight damage caused by free radicals . Try our special formula and see the results. This product contains NO animal products, soy, wheat, gluten, sugar, salt, yeast, milk, artiﬁcial ﬂavors, colorings or preservatives. Enzymax, a vital digestive enzyme complex, is a registered trademark of Maxi Health®, LLC. I use to suffer constantly from colds, especially on Shabbos mornings. Since I started taking Max-C from Maxi Health every monring, I rarely have a cold. Thanks for your great products! My sister got a burn on her face and stomach. The hospital burn unit told her that she should take a lot of Vitamin C. She stayed in the hospital for 2 weeks. When she came home, my mother gave her Maxi Vitamin C and now any sign of the burn is gone.